When we arrived to Baños we had no idea this type of activity existed. Once we asked around what this was, we were hyped up and ready to tackle it! This was by far the best adventure we had in Baños! How does climbing down some cold waterfalls sound to you? It was definitely a rush and a great experience. 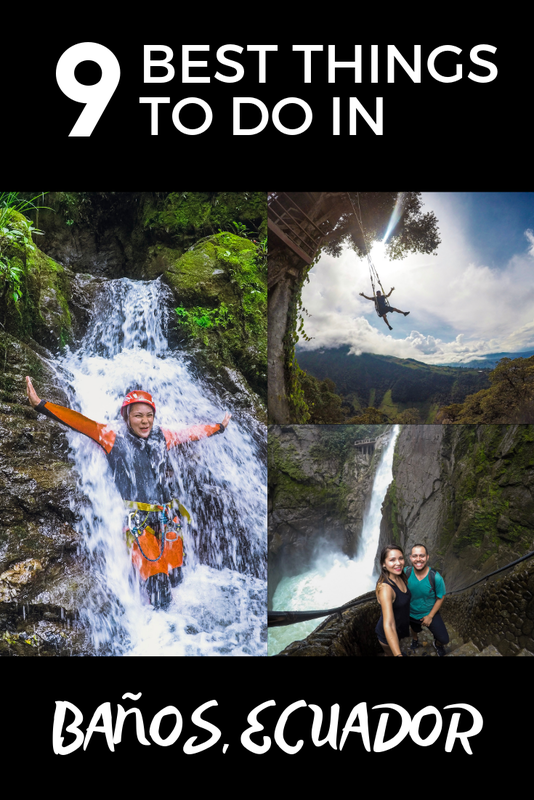 Check out our canyoning activity with Ivaga Tours. Another fun and easy activity to do on your own is to chase one… two… or seven of the incredible waterfalls around Baños! This is simple enough and you can bike at your own pace. Make sure you get a good bike so you have no issues while going up and down those hills. You can read more about our waterfall chasing activity. This was definitely the main reason why we made our way to Ecuador in the first place. We had seen pictures and videos of the powerful Pailon Del Diablo, but wow… it was more impressive than what we could of imagined. Make sure to get up and close to the waterfall. You have two options to visit the waterfall when you arrive: old entrance and new entrance. The new entrance is used by many tour operators and only gives you the view of Pailon Del Diablo from the top. It is still a great view of the waterfall and the cool stairs, but our favorite was definitely the old entrance. You will find this entrance once you pass the bridge. Keep going straight and you will see people directing you to park your bikes for FREE. You really can’t get lost as the road will come to an end and you will not see anything else past the entrance. This is the entrance that allows you to walk down the steps and crawl through a small cave to get behind the waterfall! It was just unbelievable. More details on Pailon Del Diablo here. This one is just a must in Baños! One thing you will learn right away is that there are tons of swings all over Baños so you will have many options to swing around and feel like a kid again. Although there are many swings, there is only ONE original Casa Del Arbol. There are many ways to get up to this swing including Chivas and Taxis. Our recommendation is to take the local bus up that costs $1 per person. It goes up several times during the day and it also comes down on a scheduled basis. This will also be great because you will go on your own schedule and swing away for as long as you want. When you visit in a tour, there is a line to swing and it does not make for a good experience. We enjoyed it so much, we went up there 2 days in a row. The MVP up there is definitely Alex! He is the person who pushes you in the swing and man does he take this seriously. He is the main reason we were able to capture some very fun and scary moments! A must do in our books! We were lucky enough to be in Baños for the weekend and experience some of the fun nightlife. It was also a big weekend for us as it was Lorena’s birthday and we made sure to budget for the beers. (Funny story… last year we were in Singapore for her birthday and we didn’t do a lot of drinking as all beers were about $15 per beer!) This year, we made sure to be in a place that would not destroy our budget just by getting some drinks. We started to pregame and bought some beers in the corner store and headed out to the streets of Baños. You will notice many people having some beers or a bottle of something in the streets and just hanging out. The party started around 11pm or 11:30pm. We got another round of beers and then headed to what would be our party spot in Baños… Leprechaun Bar! This was definitely the spot to be at. They had several rooms with music and the party was just good! We danced and drank until the late hours of morning. It was almost 3am when we decided to head back to our hostel. But not before getting a couple of pizza slices and calling it a night. Another one of our favorites was Leprechaun Cafeteria and Cherusker Artesan Beer. After our canyoning activity we headed over to Cherusker for some cold and good tasting artesanal beers. During our activity, we met some cool people from Canada and Australia and decided to grab some beers together. We made it there just in time for happy hour and had a few rounds of beer. We then decided we were done drinking... well for for the couple of minutes as we walked across the street to Leprechaun Cafeteria. We ordered another round of beers and got some snacks to go along. I must admit the bars and nightlife in Baños pleasantly surprised us and we were able to have a really good time. Another thing that Lorena wanted for her birthday was a massage. Luckily for me, they offered couple massages! We found a great deal, a one hour massage for both of us for only $35. We decided to get our massage after doing the canyoning and bikes. I must admit, that I am not big into massages but this was a good one. I actually fell asleep towards the end. It really relaxed us helped out with those sore muscles. They also have baños de caja which sounded very interesting, but we did not have enough time to try. With so many activities you can do, don’t forget to get some trekking into your schedule. There are multiple hiking paths you can do on your own. Make sure to visit the office of Tourism and get your map. The map highlights all the senderos and the important things around Baños. One of the most challenging senderos is the one that takes you to the Mirador De La Virgen. I will say that the stairs going up are the easier part of the trek. You will also get some incredible views of Baños from the top. If you continue following the steep path, this will lead you towards Casa De Arbol. Fair warning: Going up is tough. We met some people that decided to turn back down after 30 minutes of walking. We recommend you take the bus up to Casa Del Arbol, then you can walk down this path. This is what we did. Our favorite trek in Baños was our walk from Ojos Del Volcán. This is one of the best, if not THE best view in Baños. You can actually see Volcan Tungurahua from this spot. We had the opportunity to meet the owners of Hostel Timara and they were nice enough to take us to their property in Ojos Del Volcan. The view is simply breathtaking! Rogelio was so kind to make us fresh juice and make some incredible popcorn. We were hanging out and enjoying the views. The best part, hands down is his swing that gives you views of the Volcano! This is a hidden gem and hopefully something more people can experience as they visit Baños. We heard the stories of how good the hot chocolate is in Ecuador and we had to give it a try. We decided to swing by Honey Coffee and Tea. This is a very stylish and hip spot in the center of town. We had the chance to drink coffee and give the hot chocolate a try. We also enjoyed the spot as it has good WiFi and a place to get some work done. There is no way you can go to Baños and not get on a Chiva. They are lively, colorful and play super loud music! You can get on a Chiva to visit the waterfalls, tour around the city or go up to the mirador at night. We were able to find a Chiva for $3 per person and decided to give it a try. We wanted to get a view from Baños at night and this Chiva took us up there. Expect loud music and people enjoying it. I will admit that the Chivas can get crowded during the day and I would recommend not to do a tour on a Chiva during the day (you will be better off renting a bike and going around at your own pace). When you look online you will find many places to stay in Baños. We highly recommend staying at Timara Hostel. The owners are great and really make the difference when staying at any hostel. They take the time to chit chat with you and give your recommendations on things to do around Baños. The rooms are very clean and comfortable. The bathrooms which are shared remain very clean and the hostel has a shared full kitchen for your use. The location is great and we had no issue walking back to the palace at 2 or 3 in the morning. Lastly, the rooms are very well priced for what is offered. We ended up staying 12 days at the property and felt welcomed at all times. Muchas Gracias por todo! This little and lively town in Ecuador has definitely given me a different perspective about the word Baños. This was a town we fell in love with and would not hesitate to recommend you visit. The best part of all these adventures is that it will only help prepare for the amazing Quilotoa Loop! Get ready... a lot of Ecuador still left to discover!